One of my favorite types of gifts to give and to receive are theme gifts: a collection of elements that can make up a much greater whole. We received several such gifts when we were married many (many!) years ago, and I’ve given my fair share over the years, too. Within the genre of theme gifts, one sub-category gets the most love from me: culinary theme gifts, culinary gift baskets in particular. Something – several things – food-related. Delicious! between. The take off point for culinary gift baskets and other culinary gifts can be small, and just keep in mind that they are as much fun to give as they are to receive. from a secret source; a week later it arrived. A couple days after that I wrapped it up and mailed out one fabulous salad-centric wedding gift. house and/or the giftee can access refrigeration quickly, it is probably best to forgo a perishable gift, such as a cheese themed basket with artisanal cheeses. 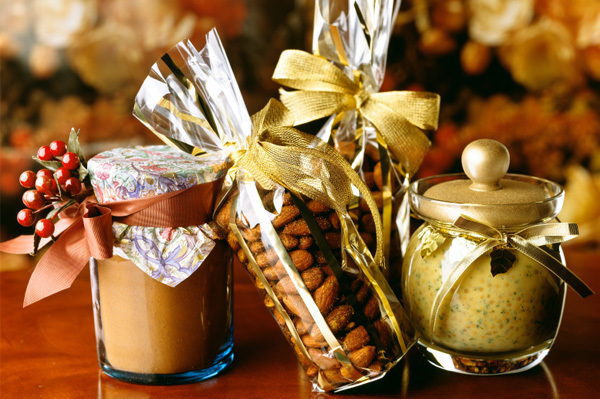 Once you get started putting together culinary gift baskets and other culinary themed gifts, it can be hard to stop. Hopefully these combinations will be just the start for you! This one is really fun to give to a teacher along with a bag of good baking apples. Whatever theme gift you put together, the most important element is delicious fun. Decide on the theme, choose your gift ingredients, and wrap them up in a creative manner.